Organiser Nazrudeen (Jumbo Jet) Mohammed Junior presents the three year old West Indies bred trophy to Afiah Shariff of the Shariff Stable. When the dust settled it was the Elcock, Jumbo Jet and Shariff Stables that were smiling the most. The Jumbo Jet Stable chalked up five wins, carting off the first five races. The Shariff stable took the three year old event. However, it was the Elcock Stable that got the biggest pay day with first and third placing in the feature event. 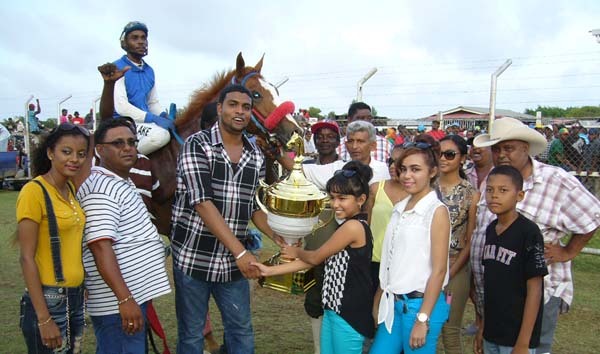 The feature race for animals classified D1 and lower over 1500M saw an upset with the recently imported Kentucky Bred Curfew Tower out of the USA in only its second outing on Guyana’s soil, dazzling the field with tremendous speed to take the race from an impressive field. The animals were out of the gates on a level break with the speedy Princess She Not and Curfew Tower with Junior Sookhan on the perch taking the lead and hitting top gear early. Amazon Warrior with Badrie winning the Two Year old Guyana Event from Miss Messiah of The Gansham Singh Stable with Paul Delph in a close finish. the field looking good as they headed for home. From his perch Jockey Sookhan put the field under ‘curfew’ as Curfew Tower kept the momentum, racing across the finishing line to take the $1.5M and Banks DIH Trophy. Treacle moved into second position as C.P Got Even, known for its excellent finish, placed third and Grande De Roja fourth. There was a ding dong battle in the Three Year old West Indies bred 1500M event as the newly imported Jamaican bred Spit Fire of The Shariff stable with Kevin Bake was on fire. 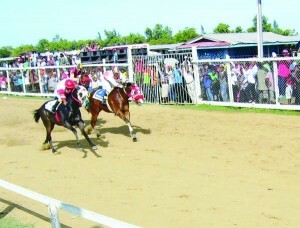 The horse showed why it is a class act as it went out early to win in its first outing on Guyana’s soil by topping a top class field to take the $1M as it held off Just Call me Boss, with Settling Jet and Unsettled rounding out the money. Keep on Swinging of The Jumbo Jet stable with Prayven Badrie swung into gear with a driving finish as it won the two year old West Indies Bred 1200M event and the $600,000 from stable mate It’s My Choice, with Settling Star and Midnight Blue being the others that placed. Captain Crook of the Jumbo Jet stable again with Badrie on board came through with a driving finish to pip Right to Rule on the line to take the E and Lower 1200M event and the $600,000 first prize ahead of Appealing Harvest and Swing Easy. Appealing Harvest ridden by Colin Ross of the Jumbo Jet stable was a gate to pole winner in the G and lower 1200M event ahead of Damascus Dream, War Craft and Rosetta to win the $500,000 top money. Amazon Warrior with Badrie of the Jumbo Jet stable won the Two Year old Guyana Bred 1200M event and the $300,000 from Miss Messiah. It was indeed a special day for the connections of the Jumbo Jet stable as She So Special of that stable with Colin Ross won the H class 1000M race and $250,000 ahead of Mary Ann. Royal Cash with Rodrigues won from, Affinity, Red Jet and Party Time in the ‘I’ class 1000M event. Jockey Badrie of the Jumbo Jet stable was the top rider on show, while the Jumbo Jet stable rode away with the champion stable award and trainer Carlton ‘Black Mouth’ Pluck of the Jumbo Jet stable the top trainer. The day’s activity was by and large incident free with close to 80 horses participating and some $10M in cash, trophies and other incentives up for grabs.